guitars. The bass. The drums. EVERYTHING. It all works. nearly giddy. What a find, I kept telling myself. What a find, I tell myself today. horns. A total cacophony of brilliant pop in just over three minutes. what Oasis had desperately tried to accomplish on their fabulously famous failure, Be Here Now. rocked, and the $11.99 I had spent on the disc kept feeling like less and less with every listen of every song. McCartney got together and had love-child through song, this would be it. sounds like they’re playing it with their collective elbows leaning out of a rusted-out Chevy on a summer day. is nothing else like it anywhere. 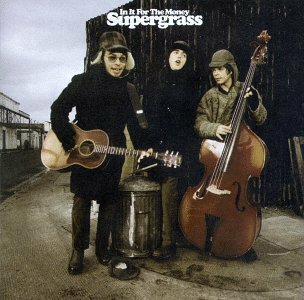 It’s still my favorite Supergrass song. are all must-haves. But In It For The Money still takes the cake. were overlooked as easily as they were. the noise you allow to invade your ear canal. hold true, it will probably be great.